Ferris Bueller Super Bowl Ad teased, but Who is Behind it? Ferris Bueller's Day Off is a classic movie from the 80s. Matthew Broderick played a cool high school kid with lots of tricks up his sleeves. The internet has lit up today because of a 10 second teaser video featuring Matthew Broderick playing Ferris Bueller. 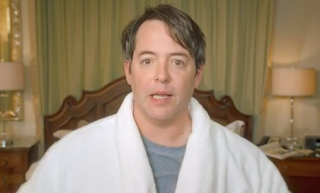 Matthew Broderick just says one line in the video: "How can I handle work on a Day like Today." The video got uploaded by a new account that also favorites several Ferris Bueller scenes. The description of the video is only hinting on a big reveal on Super Bowl Sunday. Video Description: "We hate to be such a tease, but on a day like today, we just have to. Stick it out until the Super Bowl, or take a "day off" on Monday and catch the big reveal." The Honda Super Bowl 2012 Ad is supposed to have Ferris Bueller. The mystery is solved. The 60 Second Honda Super Bowl commercial is containing scenes from Ferris Bueller's Day Off movie replacing the cars with Honda cars. Many commenters on the video express hopes for a Ferris Bueller sequel. This is a possibility, but not very likely. What is more realistic is that a Super Bowl advertiser hired Matthew Broderick to play Ferris Bueller in a Super Bowl 2012 commercial. Just remember what HomeAway did with Chevy Chase and the 80s movie National Lampoon's Vacation at the Super Bowl 2010. This sounds like the same concept. HomeAway is though not advertising at the Super Bowl 2012. We will keep our eyes on this mystery Super Bowl 2012 Ad. Watch the Ferris Bueller Teaser video below.